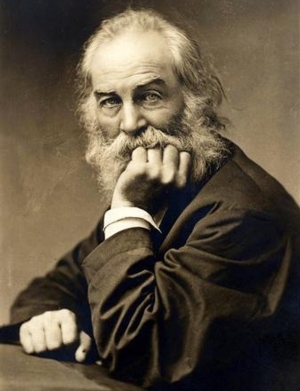 Walt Whitman's poetry spanned 19th century American life, and it is fitting that a bridge that crosses the Delaware river connecting Philadelphia and Camden, where he spent the last eighteen years of his life, is named for him. Although he travelled less in America in his later years, he crossed the river hundreds of times on the ferry connecting the two cities, so often that he was eventually granted a free pass. He was not idle or isolated. Many people visited him at his home in Camden, and a number of critics and memorists who grew up in Philadelphia wrote down their impressions of crossing the Delaware and meeting him when they were young, including Agnes Repplier, James Gibbons Huneker, Mary Berenson, and her brother Logan Pearsall Smith. There were more famous visitors like Oscar Wilde, and Thomas Eakins who painted his portait; but he liked, met, and accepted all kinds of people, and they never forgot him. In 2019 at the Free Library of Philadelphia, and all over the country, we celebrate the anniversary of his birth in 1819. Poet and teacher Leonard Gontarek and his students from the Poetry in Common Workshop will be part of that celebration as they read their poetry in our Monday Poets Series.